The UK company developing an engine for a new type of spaceplane says it has successfully demonstrated the power unit’s enabling technology. Reaction Engines Ltd (REL) of Culham, Oxfordshire, ran a series of tests on key elements of its Sabre propulsion system under the independent eye of the European Space Agency (Esa). Esa’s experts have confirmed that all the demonstration objectives were met. REL claims the major technical obstacle to its ideas has now been removed. “This is a big moment; it really is quite a big step forward in propulsion,” said Alan Bond, the driving force behind the Sabre engine concept. The company must now raise the £250m needed to complete the next phase of development. This would essentially take the project to the final designs that could be handed to a manufacturer. Although the British government has put significant sums into REL’s technology in the past, the company’s preference is to pursue city finance. 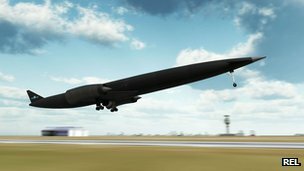 “The project to date has been more than 90% privately funded, and we intend to continue with that type of structure,” explained Tim Hayter, the CEO of Reaction Engines Ltd.
Read more: BBC News – Skylon spaceplane engine concept achieves key milestone.